In The Good Book, thirty-two of today's most prominent writers share never-before-published pieces about passages in the Bible that are most meaningful to them. 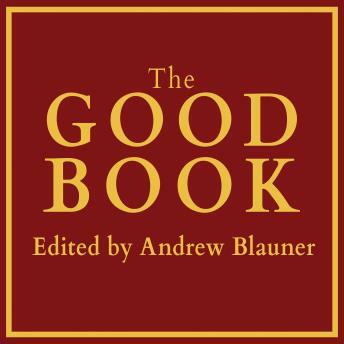 The Good Book collects new pieces by writers from many different faiths and ethnicities, including literary fiction writers (Colm Toibin, Edwidge Danticat, Tobias Wolff, and Rick Moody); bestselling nonfiction writers (A. J. Jacobs, Ian Frazier, Adam Gopnik, and Thomas Lynch); notable figures in the media (Charles McGrath, Cokie Roberts, and Steven V. Roberts); and social activists (Al Sharpton and Kerry Kennedy). While these contributors are not primarily known as religious thinkers, they write intelligently and movingly about specific passages in the Bible that inform the way they live, think about past experiences, and see society today. Some pieces are close readings of specific passages, some are anecdotes from everyday life, and all will inspire, provoke, or illuminate.